Radisson Rewards has launched a new promotion for stays in the United States and Canada between May 8 – September 3, 2018. Radisson Rewards members that book a stay minimum of two nights using promotional code TREAT18 between May 8 – 31 or July 8 – August 2 are eligible to earn $25 Amazon or Starbucks gift card. You can make your booking for this offer on Radisson Rewards website here (the promo code is included on the link), access the offer on Radisson’s website here or on Country Inns and Suites website here. Note that you must book the rate affiliated with this promo code to earn the gift card. There could be lower discounted rates available. Radisson Rewards doesn’t appear to have set a limit on number of gift cards that you can earn over separate stays from this offer. Pay attention to the redemption instruction on the T&Cs that seem rather complicated. Offer such as this can make sense IF the rate associated with the gift card is competitive and you are willing to follow up with the requirements to collect the reward (you won’t get it at the property). This gift card is in addition to the Radisson Rewards points that you earn for your stay. 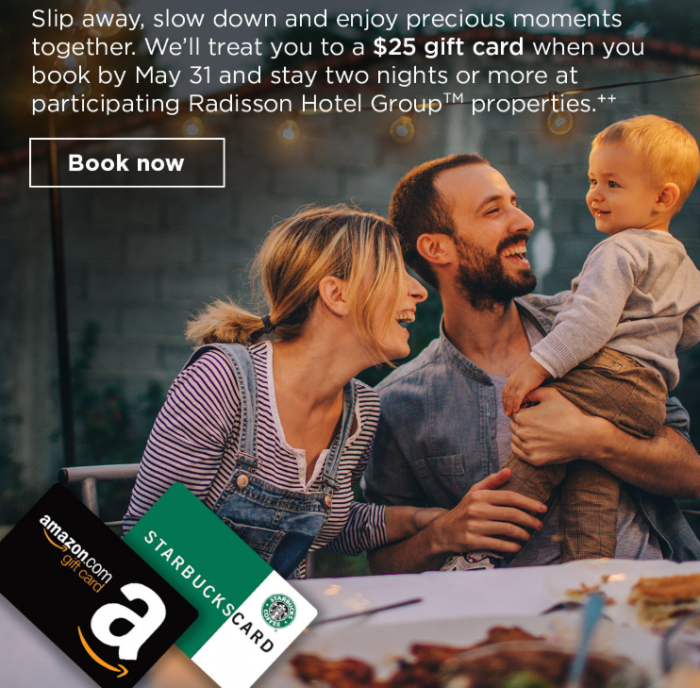 The Treat Yourself promotion includes an option of a $25 Amazon.com (or Amazon.ca for Canadian residents) or Starbucks Coffee Gift Card under the terms and conditions described below and is available for new reservations at all Radisson Hotel Group hotels in the U.S. and Canada for Eligible Stays that are booked from May 8, 2018 to May 31, 2018 or July 8-August 2, 2018 and completed from May 8, 2018 through September 3, 2018 (“Promotion Period”). An Eligible Stay is defined as a stay of two (2) or more consecutive nights booked and completed during the Promotion Period at the same hotel for which the guest specifically booked the Treat Yourself rate. Promotion may not be used in conjunction with any other package, promotion, group or convention rate, or any other discounted rate. Other exclusions may apply. Void where prohibited by law. In order to receive the $25 Amazon.com Gift Card, Amazon.ca Gift Card or Starbucks Card (each referred to as a “Gift Card”), guests must: (1) complete an Eligible Stay; and (2) be a resident of the US or Canada; and (3) register the Eligible Stay online with their confirmation number, name, address and email address (“Registration”). Guest will be given information at check-in with Registration instructions. Registration must be completed and received on or before 11:59 PM CST October 3, 2018 to be eligible to receive a Gift Card. A certificate code for the Gift Card of your choice will be emailed to you at the email address provided during Registration within two weeks of completing the Registration. You must redeem the certificate code for the Gift Card within 30 days from the date you receive the email. After 30 days the certificate code will become invalid. Radisson Hotel Group is not responsible for (1) interrupted or unavailable network, server or other connections, miscommunications, computer hardware or software or technical failures, Internet Service Provider/network/website accessibility or availability, garbled or jumbled transmissions or other errors of any kind, whether human, mechanical or electronic; including without limitation the incomplete, incorrect or inaccurate capture of Registration information; or (2) lost, misplaced, or stolen Certificates, whether via mail or otherwise. Radisson Hospitality, Inc. reserves the right to add, modify or discontinue the Promotion with or without notice. Other exclusions may apply. Void where prohibited by law. By participating in the Promotion, you agree and consent to these terms and conditions. Previous articleShould BA Allowed To Wet Lease Non-EEA Registered Aircraft With Crews From Qatar Airways (Again)? Send Your Comments To CAA!